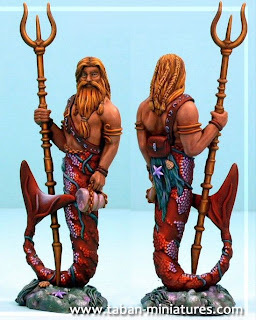 The Nauticans for Warhammer Fantasy Battle: We have found The King of the Seas ! We have found The King of the Seas ! Anyway, here he is in all his glory, and 100mm (or 10cm tall) aswell. Perfect. All credit goes to Axinous. I'm ordering him this week and will post pics soon. Permission for posting image has been requested. yep, I agree John. It was a real find by Axinous. All you need to do is paint his Skin Cyan, his Hair White, Tail Blue-Green & you've got the King of the Seas. The King of the Seas is the guy on the cover, right?